?Youth for peace and development? India is the second biggest country in Asia. It has diverse religions, cultures, casts, and climates. There are many disputes due to religion and cast. As you know there also border conflicts between India and Pakistan. Due to the problem, people have been killing each other. You can see the same problem in Nepal and Bangladesh as well. Once a year, we hold the Peace March project to help people be aware of this situation. YBS(Youth Buddhist Society) is trying to create mutual harmony and friendship in spite of their religion: Buddhist, Hindu, Muslim or Christian. When national and international governments cannot stop the violence and conflicts, it is time for youths in the world to take action and put an end to one of the longest running conflicts in history. This humanistic and peaceful march will give an opportunity to the participants from various countries to be involved directly or indirectly in global issues. In addition, the each destination of the march is a holy site of Buddhism in history. However, the activities and the objectives are not just related with Buddhism but the peace. What is the Universal Peace March? What is the purpose of this march? Since 2005, ?Universal Peace March (UPM)? has been held in different parts of India. This year we are pleased to announce that the ?8th Universal Peace March(UPM) 2012? will be held from Udaypur-Jaislamer in Rajasthan, India with the name of ?youth for Peace?. 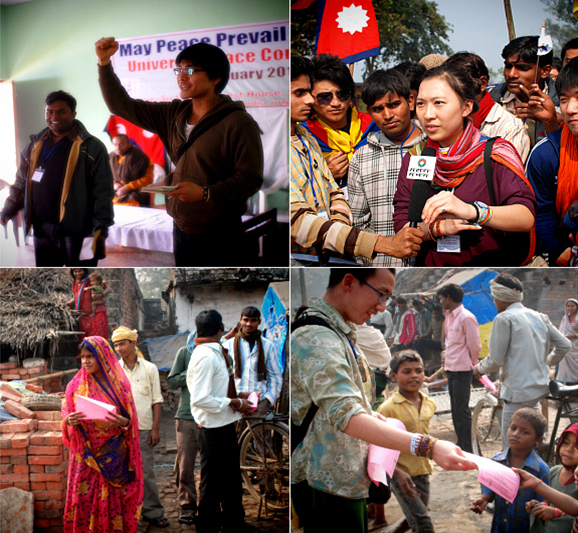 We promote peace by sharing our ideas about global issues with youths from all over the world. During the 10 day march, we will stay in different locals and have meetings with various people no matter what their religions,jobs are or where they come from. We will share ideas about how to promote peace with each other, how there can be peace among young people, and how to be aware and recover a sense of mutual humanity. In 2012, foreigners and Indian participants will march from Udaypur ? jaisalmer , India on foot. Local living condition will be inconvenient during the march in general. However, this will be a good opportunity to challenge yourself. 28, Jan 2012, 01:00pm Udaypur railway station Rajsthan in front of exit gate. : Please make sure to book your train before 40 to 45 days in advance otherwise you can’t get sits. By Train -You can have train directly from Delhi,Agra, Kolkatta, Mumbai to udaypur city (Rajsthan). By Bus – you can have direct Bus from Agra , Delhi and jaipur. Accommodation: Participants will stay in local accommodation. Accommodation could be schools, village community centers, or temples (Hindu, Buddhist, Islam, Christian, Sikh, Jaina etc). Participants should not expect convenient facilities like those in their countries, with amenities such as hot water, good toilet, beds, etc. 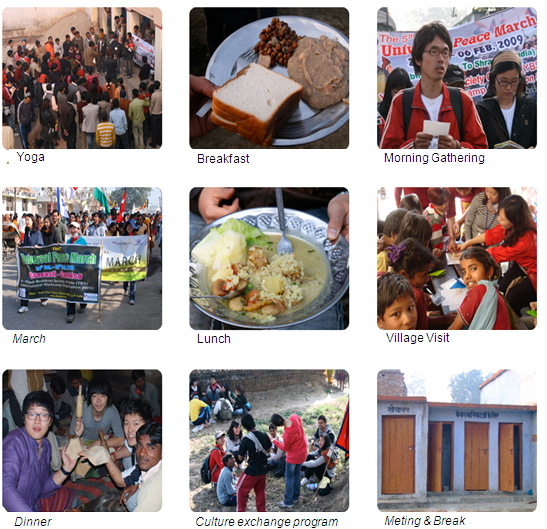 Food: During the 10–day-peaceful journey, participants will have local vegetarian food for their meals. Participants can cook vegetarian food in their own style and share. Peace March is not a picnic or a race but instead a spiritual journey to foster a positive mentality in young people and a peaceful future. It will be a time to understand the diverse value of life. * Non-vegetable food and alcohol is not allowed during the march. During the 10-days of journey, participants are asked to interaction with local people. Therefore, people who take part in UPM are asked to have OPEN–MIND, TOLERANCE. The success of UPM project depends on the volunteer being prepared to take responsibility for her/himself. The volunteer should not only be able to work independently but also be able to work well as a part of the group. To take part in a camp also means to organize the camp TOGETHER. Daily distance to march: We will walk approximately 20 km a day. If necessary we take a public transportation sometimes for certain distance.